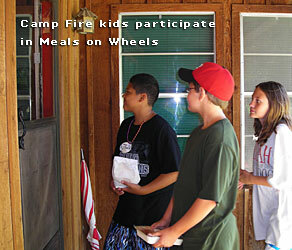 During our Camp Fire Connections program, our older members and staff participate with Meals on Wheels. Weekly, the older members and staff visit and deliver meals to those in need. Also, we are active partners with the Foster Grandparents Program. Through these programs the children are educated on their community needs. They are given an opportunity to not only make a difference in the lives of another, but in their own as well.